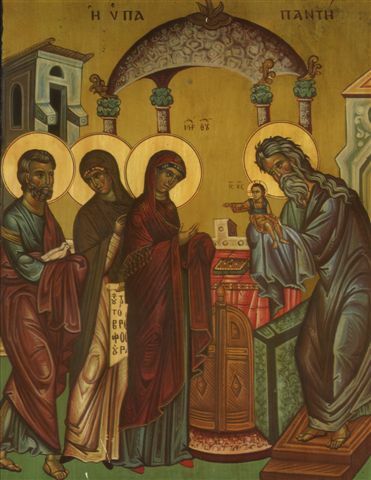 Yesterday we all were updated on Candlemas origins and the connection to the Feast of the Presentation of the Lord. Today let’s start with some more of the traditions. There are specific foods to eat. Generally crepes, pancakes, and cakes made with grain were prepared. These were used due to the round shape symbolizing the sun and the light of the renewal of faith. In France tradition held that if you could flip your crepe while holding a coin in the other hand you were guaranteed a year of prosperity. No crepes in Mexico, tamales are the food for Candlemas there. Remember those little baby Jesus figures baked into our Three Kings cakes on epiphany? If you were the one to find it, you get to pay for the tamales on Candlemas!! Some non-food significance on Candlemas as well. If you should hear funeral bells on the day, you will hear the news of the death of a close friends or relative- for each toll of the bell, a day will pass until the news. In Serbia they celebrate Seretenje on Candlemas. This bit of folklore follows the bears rising from their winter hibernation. If the bears come out and stay awake winter will end soon. If the bears head back into their caves, 40 more days of winter weather. Sound familiar?? It should. It’s almost the same as the Western European tradition using badgers to predict the end of winter. Here in North America the creature got switched around to a groundhog. 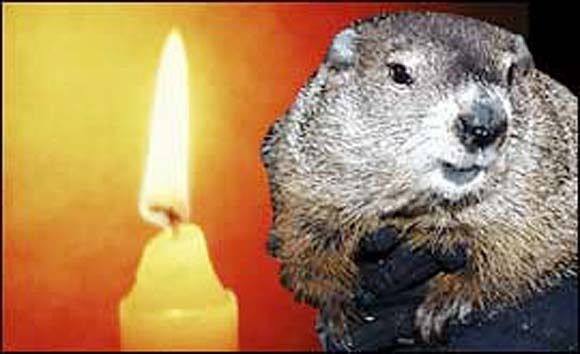 The earliest celebrations of Groundhog Day in the US started with the Pennsylvania Dutch in the mid Nineteenth Century. The PA Dutch hold festivals full of food, songs, and skits, to signify the importance of the annual Groundhog arrival. The largest festival is held in Punxsutawney , PA. Huge crowds, sometimes numbering 40,000 or more, gather to await the arrival of Phil, the resident groundhog. Phil is your average North American groundhog, which are actually a type of ground squirrel. He weighs about 15 pounds and lives year round in a climate controlled habitat. At exactly 7:25 AM on each February 2nd Phil emerges from his heated burrow to appear before the crowd. Phil is no average hog. Wild groundhogs like to eat plants, Phil’s diet is dog food and ice cream. Your average groundhog lives about 10 years. Phil is said to be over 120 years old! How does he live so long? Phil has a group of supporters known as the Inner Circle. Each summer these top hat wearing folks give Phil a dose of magic groundhog elixir. This extends Phil’s life another 7 years! That magic is about it, statistically Phil is accurate only about 40% of the time. Two other crazy groundhog fun facts. The University of Dallas actually has Groundhog Day as an official University holiday. The state of Alaska officially changed the day to Marmot Day. Seems there aren’t any groundhogs in Alaska. Governor Palin signed the legislation in 2009. A major feast is upon us. This Thursday Christians around the world will pause to celebrate the Feast of the Presentation of Jesus at the Temple. Many know this feast as Candlemas, a term used due to the connection of candles with the day- more on that later. This feast is one of the oldest in Christendom, recordings of its celebration can be found as early as 312. The feast marks the end of the 40 day period begun with the birth of Jesus on December 25th. In the time of Mary, the Laws of Moses dictated that all firstborn children must be brought to temple for the ritual of the first-born. This was to purify the mother after childbirth. Mary and Joseph made their way to the Temple in Jerusalem. Practice held that a lamb would be brought to sacrifice by the young couple. Not having the funds for a lamb, Mary and Joseph most likely took the secondary option as outlined in Leviticus. If no lamb, then two turtle doves, young pigeons. [Another connection to the 12 Days of Christmas!!] At the Temple they encounter Simeon, who through his prophecy proclaims the baby as the Christ, a “light for revelation”. By the 6th century the date of the feast had been set as February 2nd, then known as the Feast of the Purification of Mary. Back to the candles though. 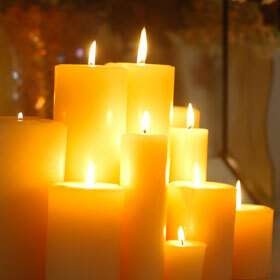 Candlemas includes a mass celebration with the blessing of beeswax candles. These candles are used to bring light into the world for the new year. Families and churches often have lovely displays of candles. It is a time to renew religious vows in the light of the newly blessed candles. Candlemas is another option to take down your holiday decorations, especially those of live greenery or plants. If you didn’t dispose of these items on Twelfth Night, Candlemas is the day to remove them, and then safely burn them. Superstition holds that to keep these items past the second will bring a death within the congregation before another year ends. Take time to clean out your fireplace and light a new fire too. New fire for the new purity! In addition to the candles and fire there are traditions involving food and more. Come back tomorrow to read more about the fun you can have on February 2nd! Countdown Podcast #6- 328 Days to Go! Donkey Time– Click to hear this week’s Podcast. This week Natalie & Jeremy planned to talk all about snowflakes. Since it is unseasonably warm and it’s supposed to be over 60 the next two days, they weren’t in that mood at all. So a last minute change was made and a new show created (much to their assistant Hildy’s dismay). 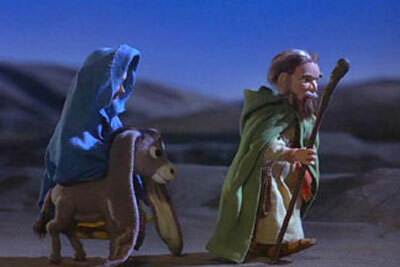 Today’s topics include more on Donkeys at Christmas- they show up in a number of songs. Discussion also begins on Candlemas coming up on February 2nd. Listen in to hear Nat’s review of Christmas Jars and their rough idea for a new holiday song classic.